Geneva – The Euro-Mediterranean Human Rights Monitor issued a detailed procedural guide in Arabic and English on Thursday to help non-governmental organizations dealing with human rights issues, that want to start interacting and participating actively in the regular sessions of the UN Human Rights Council based in Geneva. The guide is prepared in accordance with United Nations references coupled with the practical experience of the Euro-Med team in the Human Rights Council over the past years. It includes practical advice and guidance for civil society organizations on how to participate in the Council's works. Other NGO’s in consultative status with the UN, including the Economic and Social Council (ECOSOC), offer guidelines and instructions for those attending and monitoring the main meetings of the Council. They provide oral statements to Member States, submit written statements, and organize side events (parallel event) in the Human Rights Council building. The Euro-Mediterranean Human Rights Monitor explained that it had prepared the guide for its team in particular to provide advanced and detailed guidance for the development of its work with United Nations mechanisms. Euro Med decided to distribute the guide to the public in order to share its resources to other non-governmental organizations dealing with human rights issues at the national, regional and international levels. The guide reviewed the organization's consultative status with the Economic and Social Council, as well as the steps required to apply for one of the three forms of status that fall into this category: general consultative status, special consultative status and consultative status. 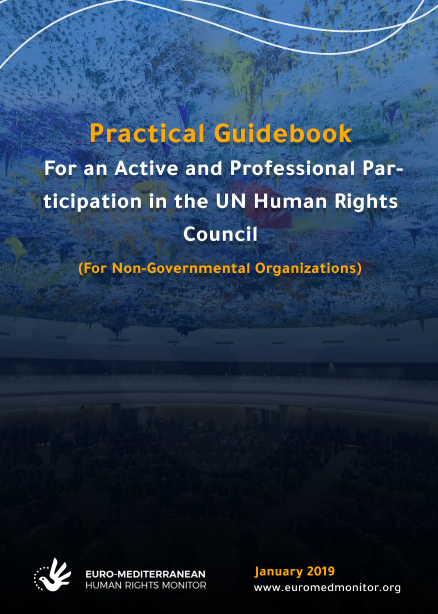 The guide presented in detail, what is aiding organizations to successfully prepare written and oral statements at sessions in the Human Rights Council. It also provides instructions to help human rights defenders learn how to visit the Council and register in the United Nations system to obtain access to the Human Rights Council building and participate in meetings. The guide notes that its value stems from the value that civil society places in the promotion and protection of human rights, including holding those in violation, whether States or de facto governments, responsible to the appropriate bodies, including the Human Rights Council, in order to make a positive change in States with poor human rights records. The United Nations Human Rights Council meets annually in three regular sessions, usually held in March, June and September, located in Geneva, Switzerland. Each session lasts for three weeks (except in March, lasting four weeks). The session is attended by States, intergovernmental and non-governmental organizations and civil society organizations. The Council is able to establish international commissions of inquiry and fact-finding missions. While the Council's decisions are not legally binding on States, they are morally important for the State's reputation and its record in the presence of the international community.